EXO's Se hun, Birthday messages from his fan club. 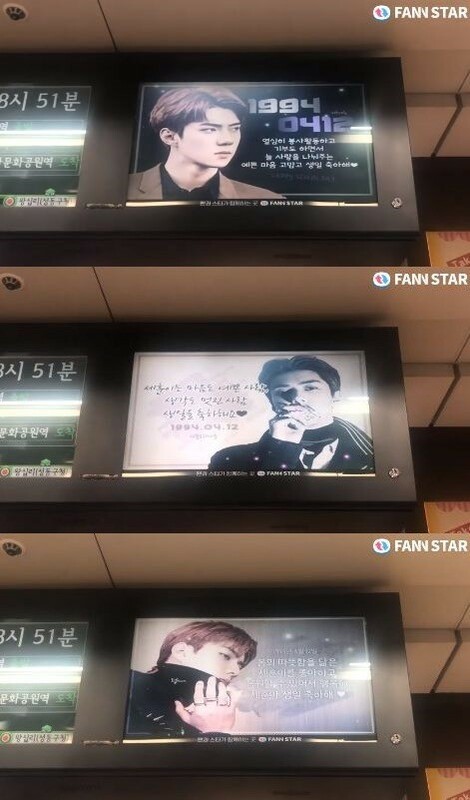 [The Fact] The idol weekly ranking website FAN N STAR operate by The Fact, released an electronic display board that is being shown in South Korea, successfully supporting the group EXO Se hun's birthday. FAN N STAR released a video of EXO's Se hun's birthday celebration on 12, which is being shown at a subway display on Line No. 2 in Seoul. On April 15, FAN N STAR held a birthday event for Se hun and achieved 100%. As a result, advertisements for electronic display boards at 43 subway stations on Line No. 2 in Seoul have been confirmed from April 9 to April 15. The released video lists the messages and photos of fans who participated in Se hun's support. In FAN N SAR, the group held a support to celebrate EXO's Baek hyun's birthday on April 5. The support will run until April 21.